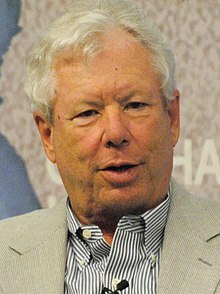 Richard H. Thaler (n. 12 septembrie 1945 , East Orange[*], SUA) este un economist american evreu. În 2017 a obținut Premiul Nobel pentru Economie. Thaler, Richard H. 1992. The Winner's Curse: Paradoxes and Anomalies of Economic Life. Princeton: Princeton University Press. ISBN: 0-691-01934-7. Thaler, Richard H. 1993. Advances in Behavioral Finance. New York: Russell Sage Foundation. ISBN: 0-87154-844-5. Thaler, Richard H. 1994. Quasi Rational Economics. New York: Russell Sage Foundation. ISBN: 0-87154-847-X. Thaler, Richard H. 2005. Advances in Behavioral Finance, Volume II (Roundtable Series in Behavioral Economics). Princeton: Princeton University Press. ISBN: 0-691-12175-3. Thaler, Richard H., and Cass Sunstein. 2009 (updated edition). Nudge: Improving Decisions About Health, Wealth, and Happiness. New York: Penguin. ISBN: 0-14-311526-X. Thaler, Richard H. 2015. Misbehaving: The Making of Behavioral Economics. New York: W. W. Norton & Company. ISBN: 978-0-393-08094-0.